Every Sunday I will be listing a "Seek of the Week" card. That is a Herschel Walker card that is not currently in the Herschel Hoard, and one that I have been chasing. 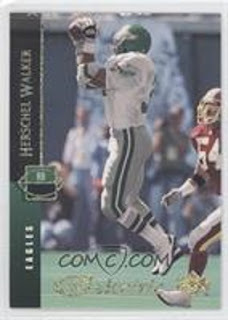 Today's card is a 1994 Upper Deck Electric Gold #262 of Walker. I have this card also listed in my top ten most wanted list at the top right of this blog. I have the base card, and the Electric Silver, but so far the Gold version has eluded me. The only difference is the coloring of the word electric at the bottom of the card front. This version, as you would expect is gold colored. This card image is courtesy of www.comc.com. That's check out my cards. com. A wonderful site, from which I have bought many cards. I thank them and heartily recommend the site for collectors.